Widely regarded as the finest military band in the World, the Band of HM Royal Marines represent the Royal Navy globally. 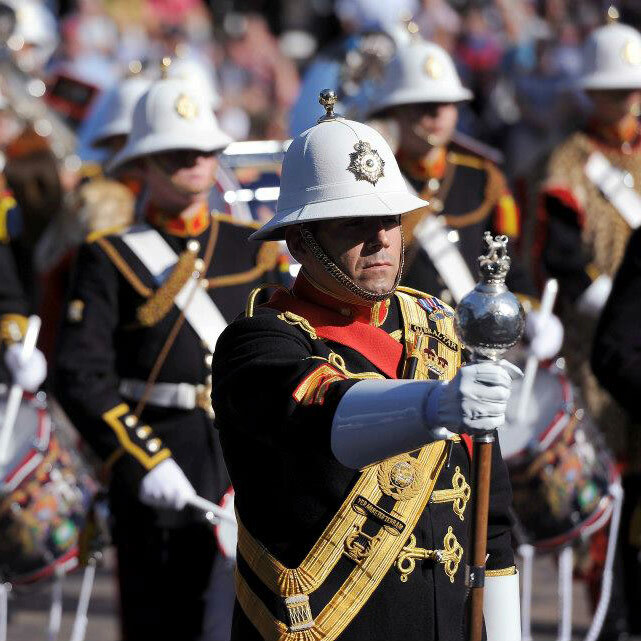 The Royal Marines were formed in 1664, the Band was born out of the requirement to communicate orders on the battlefield and move men from place to place in formed bodies. Distinct in their Blues and Pith Helmets they are made up of talented musicians who also deploy in operational theatres as part of the Medical Group. The band are fresh from a hugely successful Mountbatten Festival of Music at the Royal Albert Hall, live streamed for the first time, they reached a truly global audience. As a full band they are fronted by the Corps of Drums who regularly wow crowds at Beat the Retreat on Horseguards. The Plymouth Band will be making a rare performance on home turf in the Royal William Yard. The historic victualling yard has always had a close relationship with the Royal Marines, the neighbouring Stonehouse Barracks were built as part of the militarisation of the peninsula designed to secure the Navy’s victualling capability. RM Stonehouse are the oldest barracks in the UK still inhabited by the original organisation they were designed for. The RM Band are famous for upbeat marching tunes but also deliver crowd pleasing modern adaptations including many cinematic classics.